With the nights drawing darker by the minute and the daytime temperatures slowly decreasing, now is the perfect time to finish off those odd little bits within your garden, with one of the top priorities being to protect your plants by mulching up around them for added protection and warmth. For your more established plants, protection isn't needed as much as it is for your younger plants. With a major drop in temperatures, younger more delicate plants are at a high risk of being damaged or even killed off once the frost penetrates their root systems. The traditional method that has been used for generations to protect these more fragile plants is to use Mulch The best form of Mulch has to be good old stable manure and non is better for this job than our Country Natural Stable Manure. For existing plants that need protection, simply add the stable manure to a little of the existing compost/soil and create a little mound around the base of the plants. Do this individually to create a warmth barrier around the root systems and to add much needed winter protection. 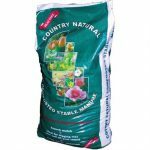 Another great use for the Country Natural Stable Manure is for preparing your garden for next year prior to planting plants or veg. Not only does it greatly improve the structure of your soil but it also helps to retain the water that some soils can't hold on to. Its main job is to feed the soil the nutrients from when it breaks down and thus, creating the perfect environment for your fruit and veg next year. Simply scatter generously onto the soil/compost area you wish to use next year and turn it over with a garden folk until it is all mixed in. Over the next months, any frosts will help to kill off any bacteria that is in the soil and with the added bonus of the stable manure, you'll have the perfect start for a wonderful crop of veg or plants in your garden for next year.